As we focus more and more on saving money and a healthier environment, the topic of composting is, pardon the pun, a “hot” one. We’ll teach you what it is, how it’s done, and why to do it in the first place. Compost is decomposed organic material that is nutrient-rich and makes a great addition to garden soil. DIY composting is simply managing this natural process intentionally. If done correctly, the end product is garden food. The benefits of composting include feeding your garden necessary nutrients which make it healthier and more productive, as well as aiding the soil to hold the right air/moisture mix. Composting is also environmentally-sound. The more we compost, the less we toss into landfills and the less we spend on garbage removal. Additionally, compost makes great fertilizer; put it around the base of your plants for best success. Compost tea – the result of soaking a bag of compost in water – is a great way to provide great nutrition to your garden, lawn, and houseplants. If you have a lot of land, this is not usually an issue; but, even city dwellers can compost. It’s important not to make it an eyesore or even the most tolerant neighbors may complain. However, it’s easy to keep your heap tidy. The open bin (or pile) method involves building a box from wood, chicken wire, or plastic and using it to contain your compost. You can also skip the bin and just make a compost pile. The open method makes it easier to keep moist, but can also result in your compost getting too much water. It’s easier to add new material, but the openness may also attract pests. The closed container method involves a special box or drum into which you put your compostable materials. The drum is the better of the two as these usually come with a cranking system which makes turning your compost a lot easier. 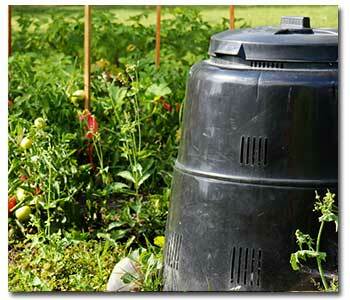 Closed containers don’t usually attract pests, but you also have to add water as they don’t collect rainwater. While either method works, it’s a good idea to have two piles or containers going at once. The process takes time and if you add too much material to an existing pile, it slows the process down. Some drums actually come with two chambers for this purpose. The ingredients for a successful compost pile are simple, sort of: Air, water, and food for the millions of hungry microorganisms that eat the material and produce compost. Air and water are pretty straightforward. Food takes a bit more thought. Compost material is divided into “Greens” and “Browns.” Green material includes items like fresh grass clippings, fresh manure (horse, chicken, cow or rabbit only), kitchen scraps (fruit, vegetables, coffee grounds, and tea bags), weeds, and green leaves. Brown material includes dry leaves and grass, shredded cornstalks, straw, and sawdust (in small amounts as it can slow the process due to its high carbon content). The optimal ratio of browns to greens is four parts brown to 1 part green. Adding inoculators, such as a shovel full of garden soil, can kickstart the process as it is rich in microorganisms. There are some things NOT to put in the compost pile. Dog and cat feces potentially carry diseases you don’t want to transfer to your garden. Barbecue grill ashes just interfere with the process, so leave them out. Newspaper and office paper are often chemically treated so it’s better to recycle them and keep your compost chem-free. It’s necessary to turn your compost pile (or rotate the drum) on a regular basis. This keeps the browns and greens balanced and makes sure air and moisture are mixed throughout. The inside, or core, of the pile is hotter than the outside and is where the work is happening. Turning the pile keeps the core fueled by bringing outside material to the center.